Keep a portable razor refill pack on hand so you’re always prepared to reload the Sphynx 3-in-1 shaving solution. 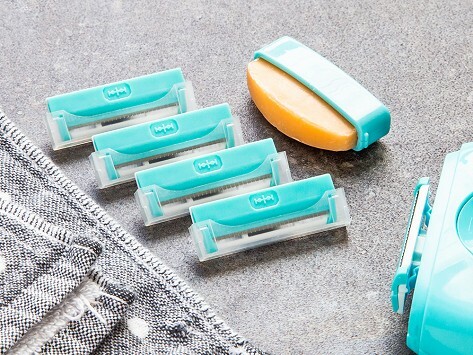 The set includes four new blades and one new moisturizing bar. Dimensions: 5.1" x 3.9" x 0.8"
After one too many “missed-a-spot” moments, Leila Kashani created the Sphyx 3-in-1 portable razor so women could touch-up at the gym, beach, or while traveling. The shaving solution is compact and jam-packed with smart features—like the sulphate-, paraben-, and gluten-free shea butter lotion bar that won’t melt in high temps, the single-blade design for less clogging and easier clean-ups, and tiny little holes that let the razor breathe. There’s even a built-in back-up blade. The colorful, discreet compact looks great, too.